This melon is a cross between a honeydew and a cantaloupe. It has green flesh with a yellow/orange tinge on top. It’s incredibly juicy with juice dripping all over your arms when you eat it. My son is crazy about it. 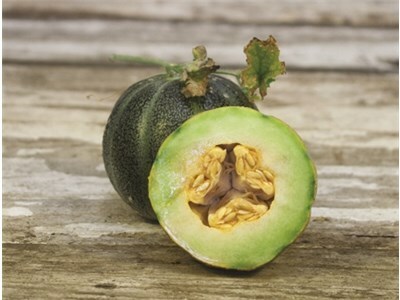 At one time, this melon was popular to grow in the United States, but it fell out of favor because its short shelf life didn’t lend itself to shipping. Now, it’s very rare to get your hands on an Ananas Melon. But one of the exciting things about gardening is that you can grow out things you’d never eat otherwise. You can buy the seeds to grow your own Ananas D’Amerique A Chair Verte Melon here.